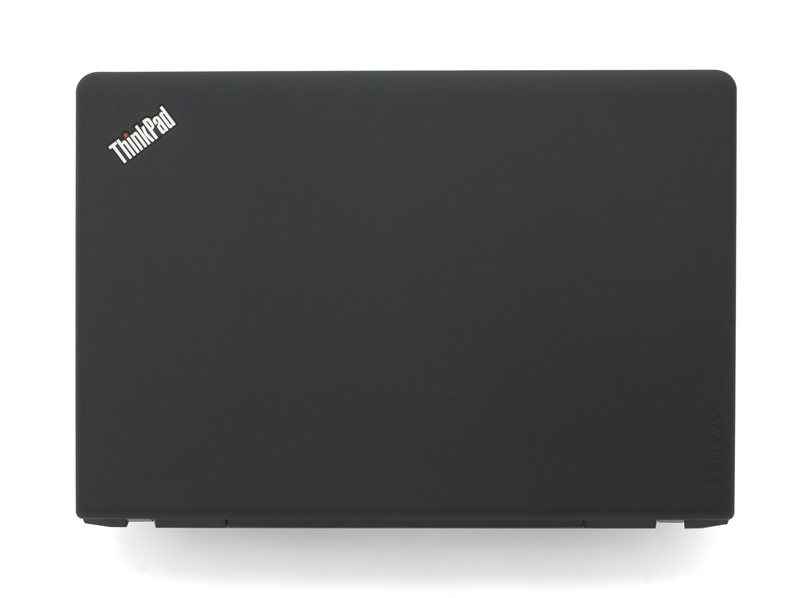 Lenovo ThinkPad Edge E570 review – a ThinkPad for business and… gaming? 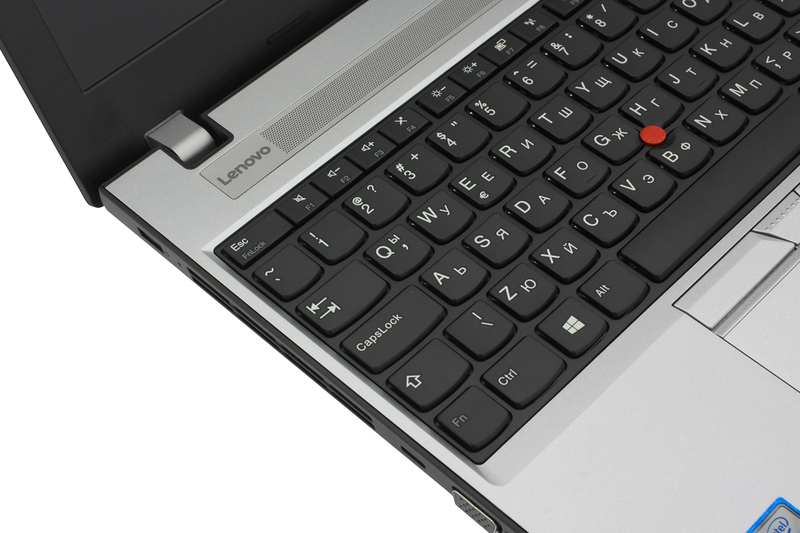 LaptopMedia.comReviewsLenovo ThinkPad Edge E570 review - a ThinkPad for business and... gaming? For years now we are used to energy-efficient and well-balanced hardware in the budget business solutions while focusing on input devices, durability and battery life. But with the release of the new generation NVIDIA Pascal GPUs, there’s a growing trend of using the Maxwell chips in low-end machines due to their relatively low price. 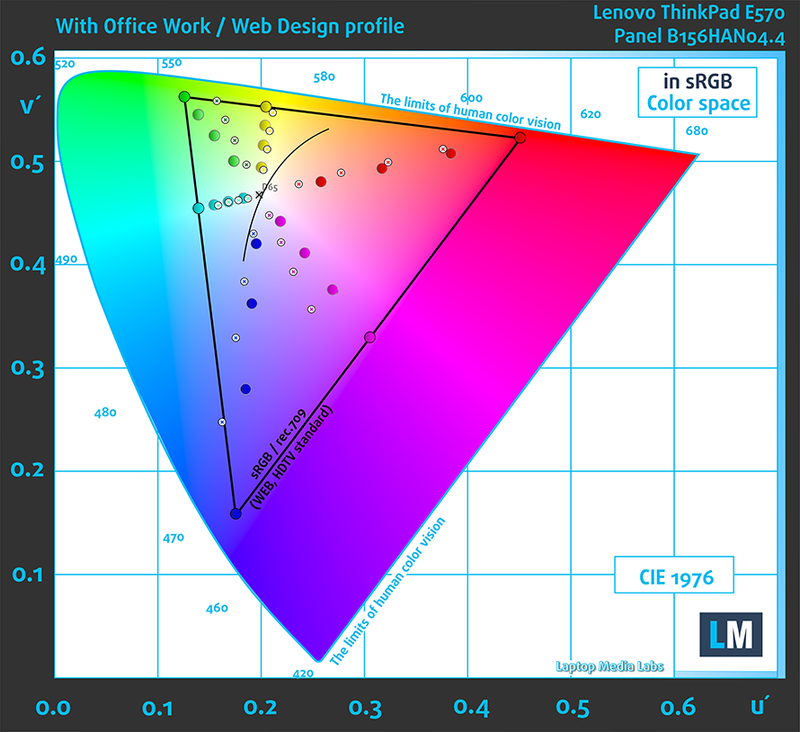 This is exactly the case with the Lenovo ThinkPad E570. At first glance, it’s just a capable budget business solution but there’s more than it meets the eye. We just got the high-performance variant of the laptop equipped with Intel’s Core i7-7500U CPU and NVIDIA’s last-gen GeForce GTX 950M GPU with GDDR5 memory. 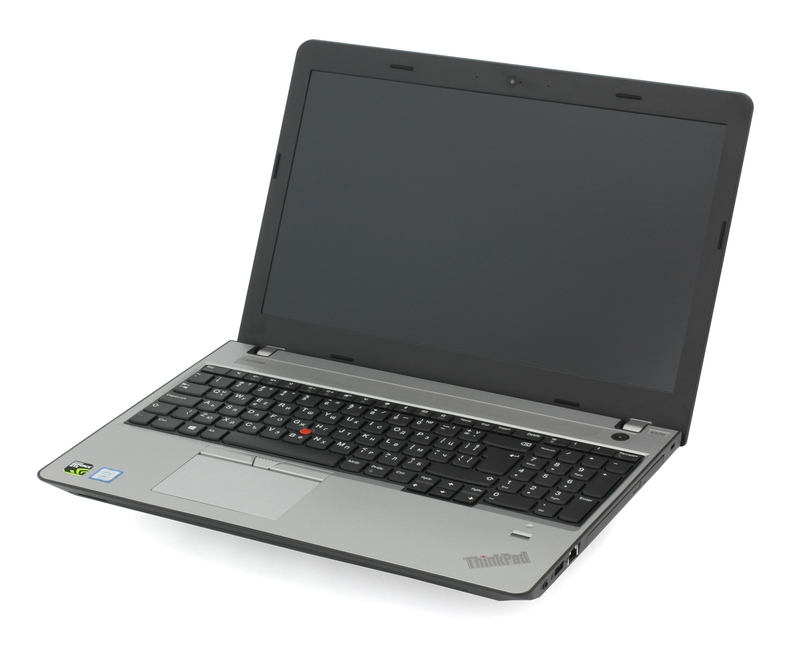 In addition, the laptop offers a Full HD IPS panel, comfortable input devices, plenty of I/Os and all of this in a ThinkPad fashion sturdy chassis. While performance-wise will fulfill the needs of every businessman, we are more keen to see how it performs during gaming, how the cooling system handles heavy workload, what’s the picture quality of the IPS panel and, of course, is the battery life any good? We tackle these questions in the extensive review below. The retail package contains the usual user manuals, the battery, which is user-replaceable and it’s detached in the box and the AC adapter with power cord. 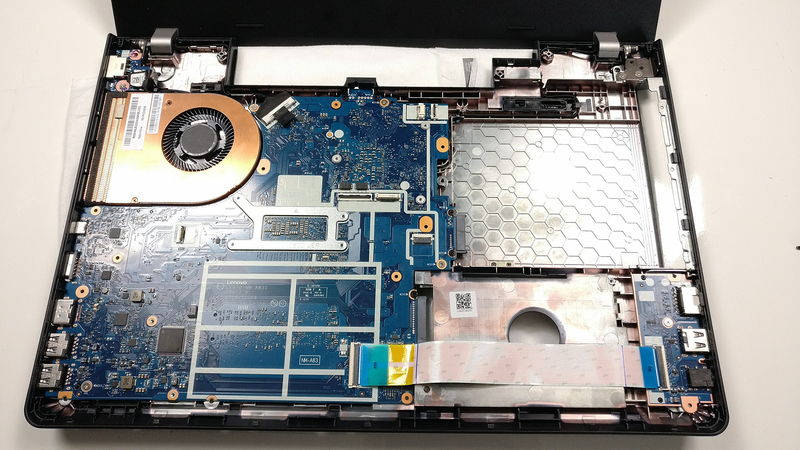 The construction of the laptop is what you’d expect from a low-end to mid-range device at first glance. 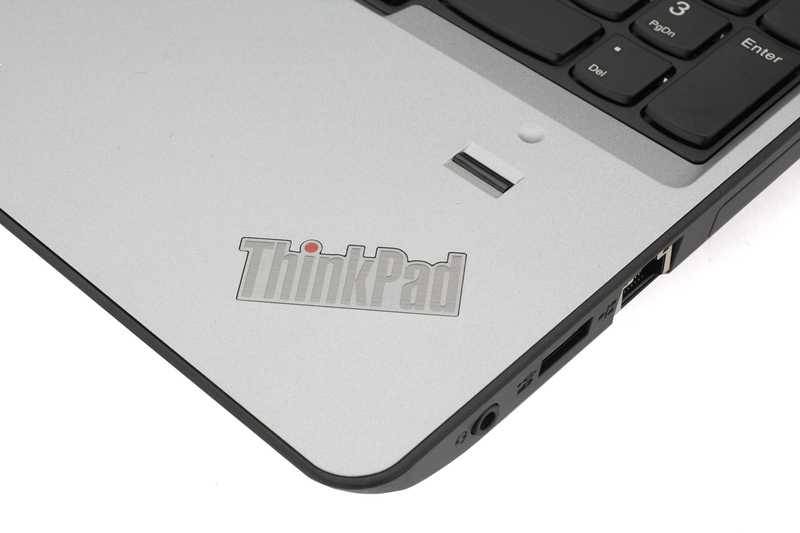 But since the laptop carries the ThinkPad branding, the build quality should be way above average. 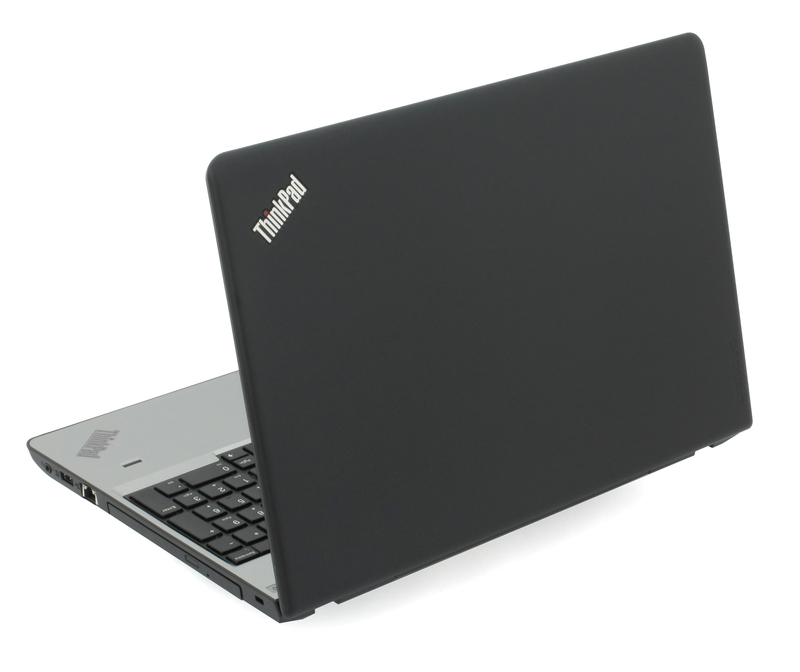 And as usual, it follows the ThinkPad design concept with strict appearance and comes in two colors – gray and black. We got the gray variant, which in our opinion doesn’t really go too well with the black lid and keyboard but that’s more of personal opinion. As far as weight and dimensions are concerned, the chassis weighs just about the average for this class while being a bit thicker but we hope the latter will contribute to better cooling capabilities. When closed, the laptop is hardly distinguishable from the rest of the 15-inch ThinkPads. 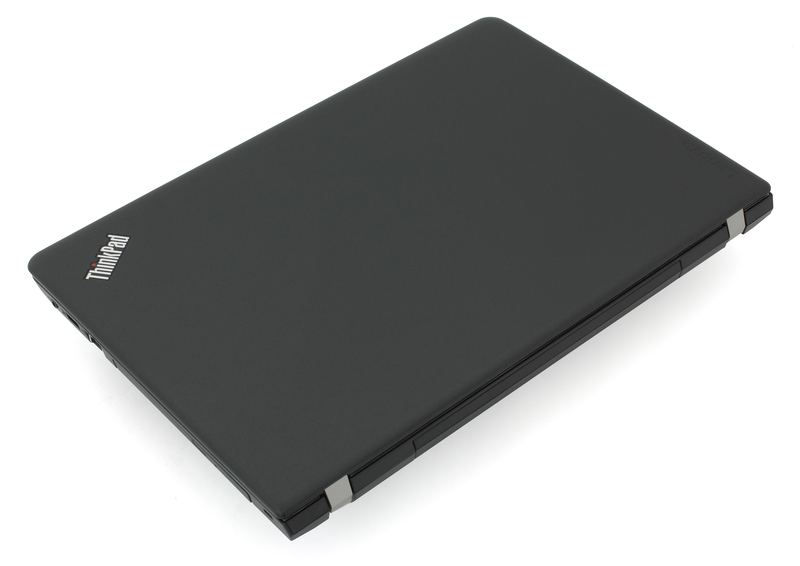 It has rounded corners and black matte plastic finish. However, this finish isn’t the usual soft-touch or rubberized material – it resembles more glass than anything because of the smooth, yet cold feel. The material appears to be slightly flexible but doesn’t let ripples to appear on the LCD panel when hardly pressed at the back. Twisting the lid isn’t easy as well, considering the price tag. 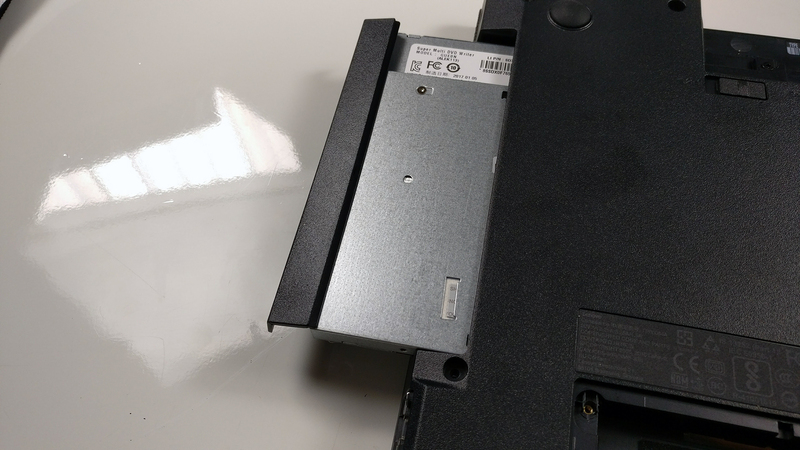 Unfortunately, the screen hinges don’t make an impression of a high-quality build as well compared to the higher-end ThinkPad models, although, they are quite firm and keep the screen stable at all times. They also allow opening the laptop with just one hand due to the steady and stealthy movement. The bottom, on the contrary, uses a roughened black plastic with plenty of vent openings for extra airflow. There’s also a service lid for easier upgrades and maintenance. The sides are part of the bottom plate using the same rough plastic finish. We find the positioning of the connectors a bit awkward – towards the front of the base. If most of them are connected, all the cables might get in the way if the working place is too small. Anyway, the distribution of the I/Os is more than okay. The left side holds two USB 3.0 ports, an HDMI, USB-C 3.1 (Gen 1) and a VGA connector, although we are unsure why are they still including this one. There’s also the main exhaust vent. The right side accommodates only the optical drive, the RJ-45 port, another USB 2.0 and a 3.5 mm audio jack. The gray variant of the laptop makes the interior look a bit clunky because the black keyboard contrasts way too much. But some users will prefer it that way probably. It uses standard plastic finish that doesn’t attract fingerprints and looks like anodized aluminum. Pressing the keyboard in the middle doesn’t really cause the base to sink in but when pressure is applied to the front center of the base and between the hinges, deformation is visible. We can conclude that the chassis is fairly stable and it’s normal for the price range of the product. 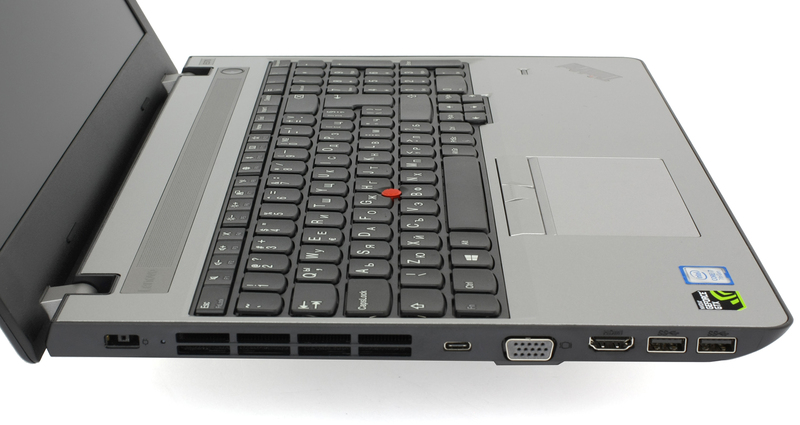 In any case, the input devices are the ones that really matter considering the purpose of the ThinkPad E570. Of course, as we expected, the input devices are great. The keyboard provides long key travel, tactile feedback, and the slightly concaved keycaps make up for comfortable typing experience. 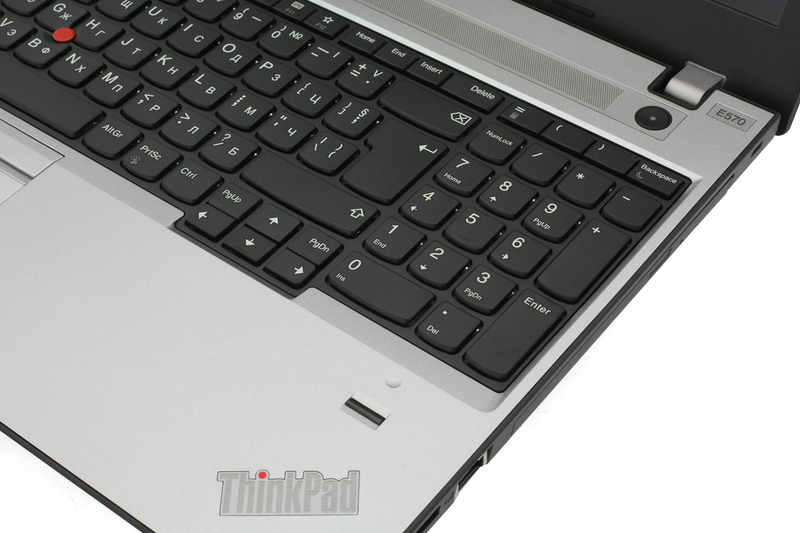 But again we have to mention the unusual keyboard layout with the function key placed in the bottom left corner. 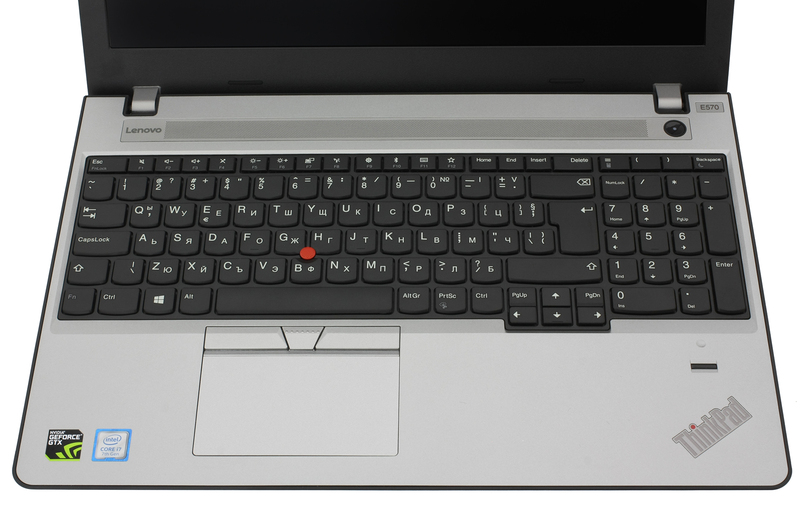 This will pose no problem to the ThinkPad users but any newcomers will need some time to adjust. As for the touchpad, it’s fairly accurate and responsive with a little bit too stiff mouse clicks. The gliding surface is nice, though, and you can always resort to using the good old TrackPoint if you want. It hasn’t changed a bit and most users who are used to the TrackPoint experience will have no issues. 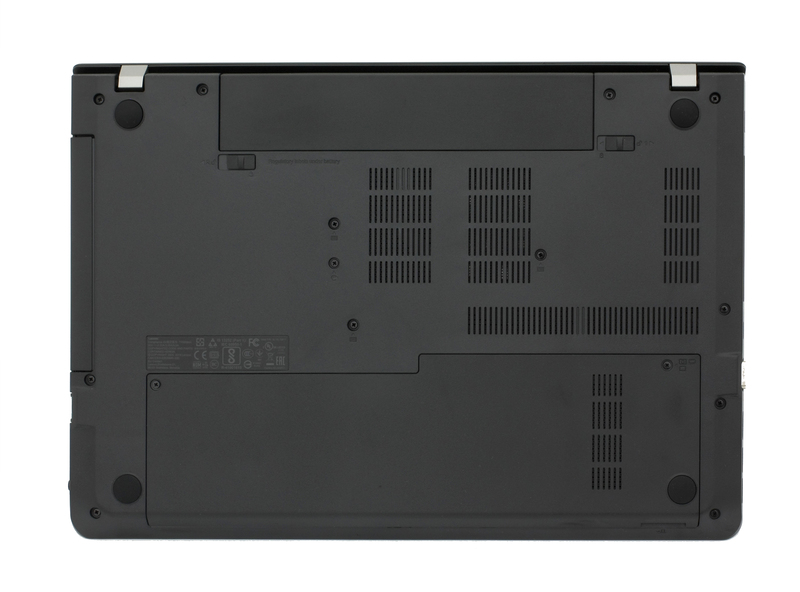 Just like the 14-inch version, the ThinkPad E570 offers a dedicated service hatch that gives you easy access to the upgradeable hardware like storage and memory. Here’s where the 15-inch E570 seems like a more lucrative offer than the 14-inch E470. 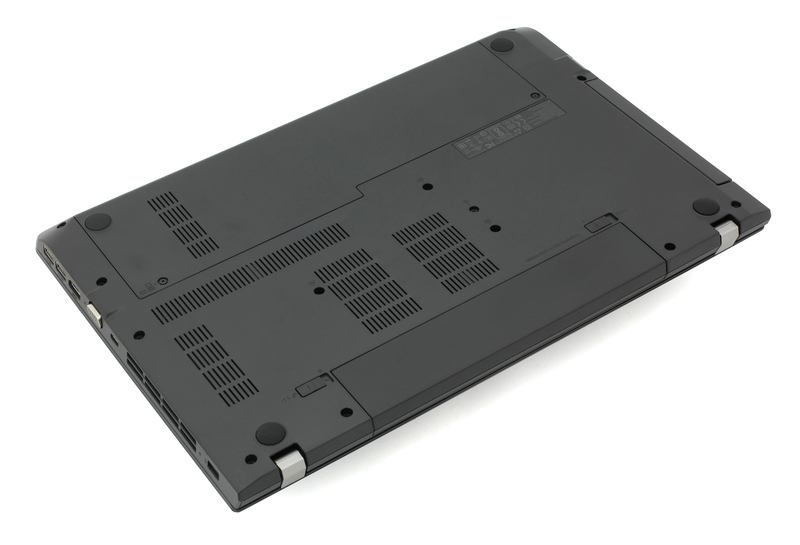 The ThinkPad E570 ships with a standard 2.5-inch HDD but can also support an M.2 PCIe NVMe or SATA SSD (2280). 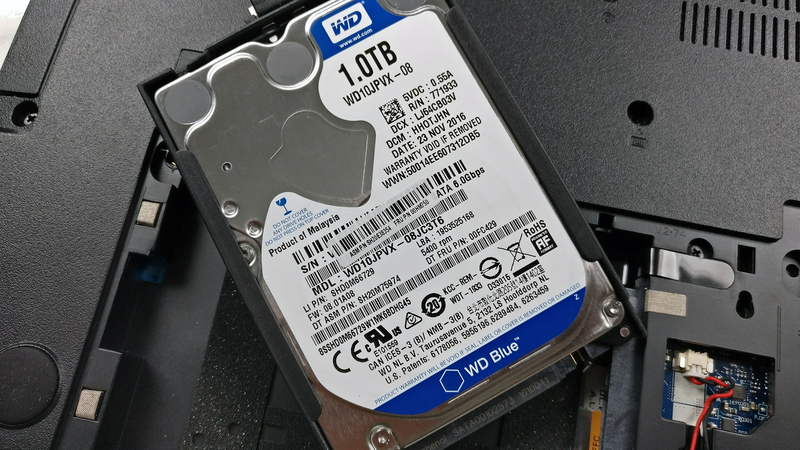 The slot was empty since we got the base model but the 2.5-inch bay was taken by 1TB WD Blue HDD. The motherboard can hold up to 32GB of DDR4-2400 RAM using two 16GB sticks. 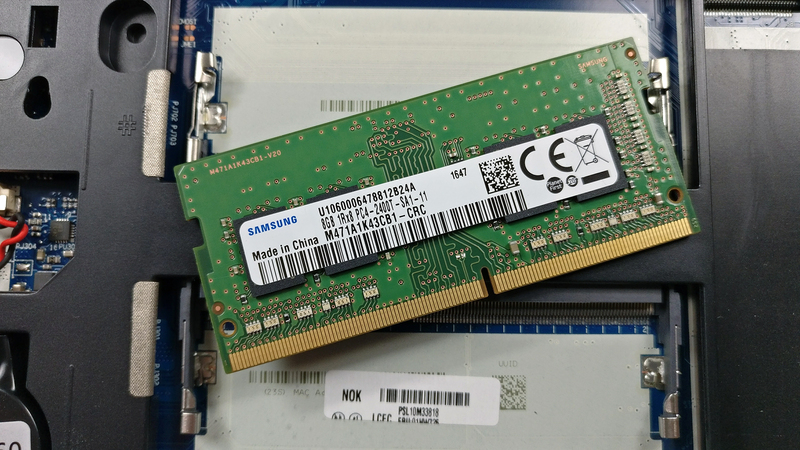 In our case, the laptop has only one 8GB DDR-2400 Samsung chip. 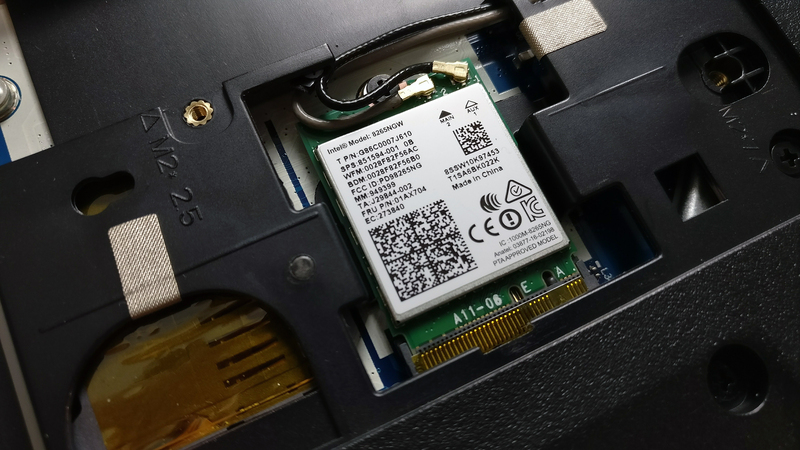 The Wi-Fi card is located right next to the M.2 SSD slot and it’s Intel 8265NGW. 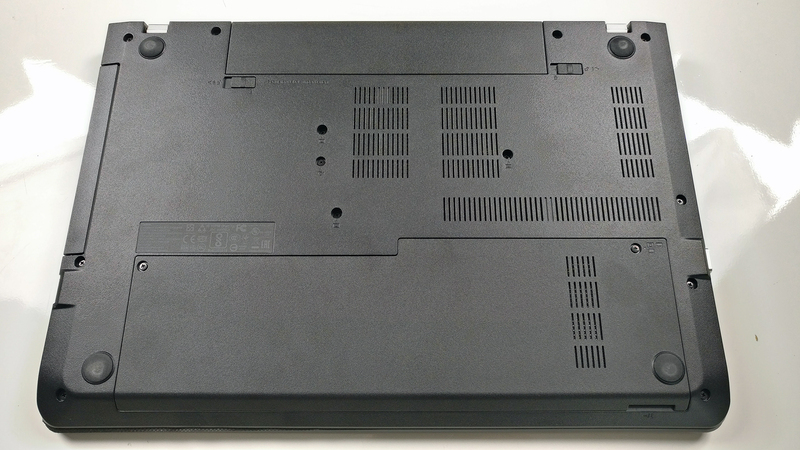 The battery is user-replaceable and can be taken out using the release lever on the back. 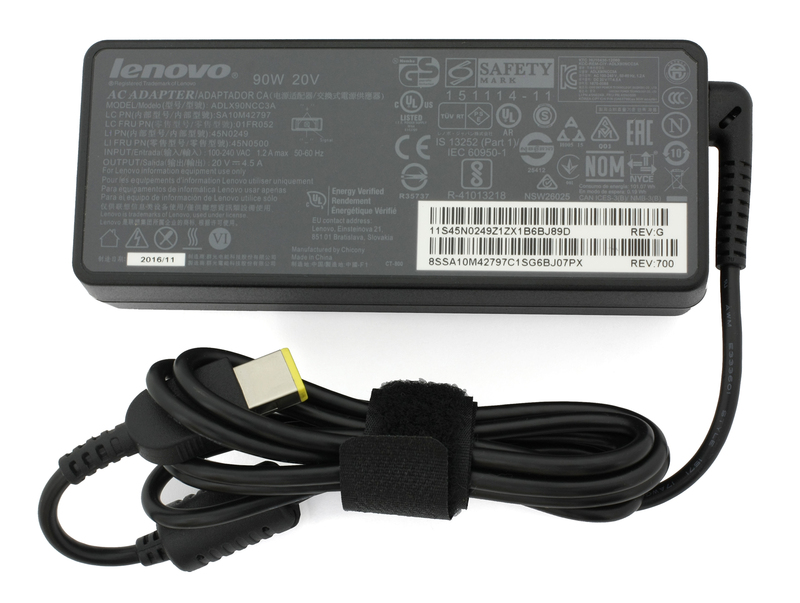 It’s rated at just 32Wh but as we said earlier, Lenovo is offering variants with bigger capacities. The full disassembly requires some patience and experience. 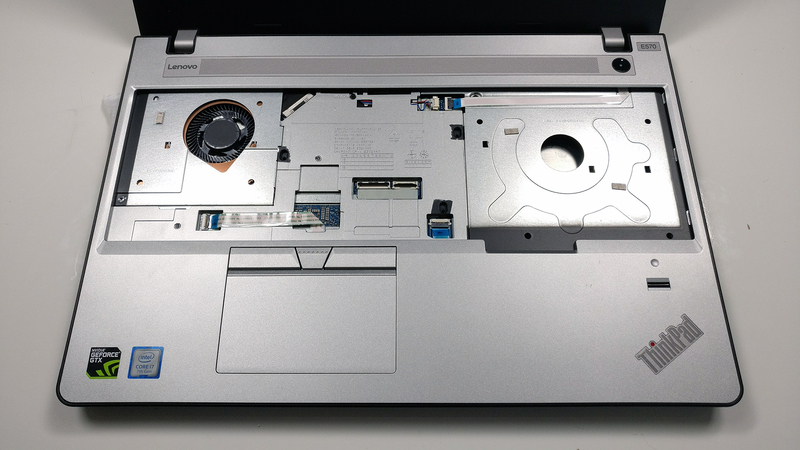 First, you need to unscrew all the bolts on the bottom including the ones that hold the keyboard in place and the optical drive. 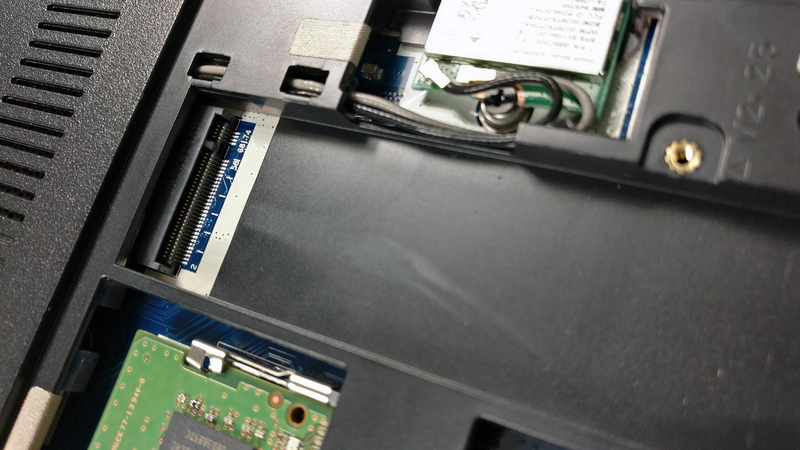 Then, you can pry up the keyboard pretty easily and remove the rest of the screws under the keyboard tray. Then, you can lift up the whole interior. 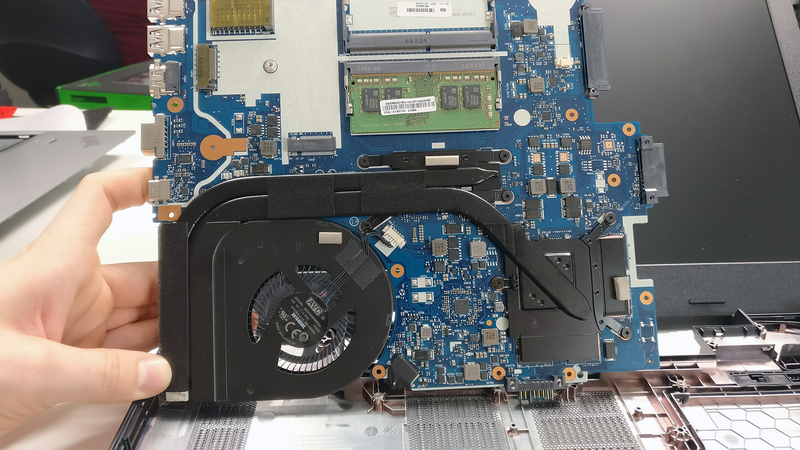 As you can see from the photo below, the motherboard needs to be unscrewed and flipped in order to access the cooling fan and the heatsinks. The display uses a Full HD IPS panel with 1920 x 1080 resolution ina 15.6-inch diagonal leading to a pixel density of 142 ppi and 0.18 x 0.18 mm pixel pitch. It’s manufactured by AU Optronics with model number B156HAN04.4 and can be considered as “Retina” when viewed from a distance euqual or greater than 60 cm. We measured a maximum brightness of 262 cd/m2 in the center of the screen and 251 cd/m2 as average across the surface. This means that the maximum deviation is 14%. 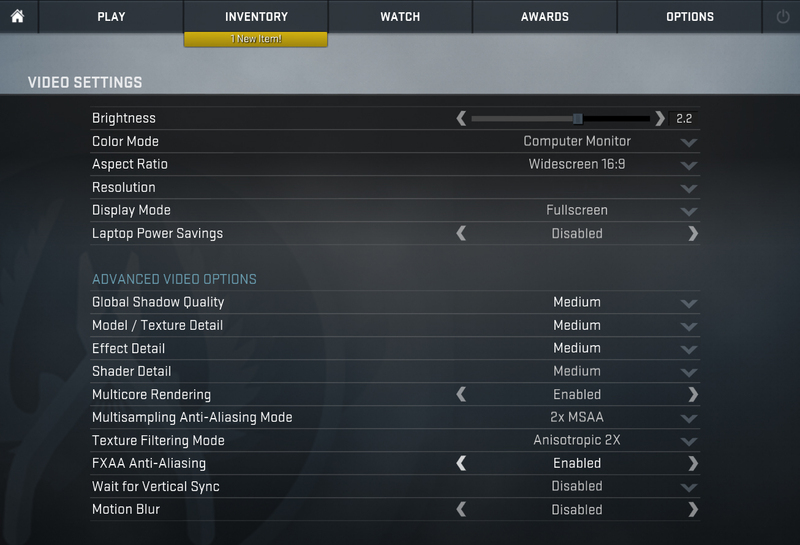 The color temperature is a bit colder than usual – 7100K while the optimal is 6500K. Colors will appear slightly blue-ish. The contrast ratio is excellent – 1260:1. 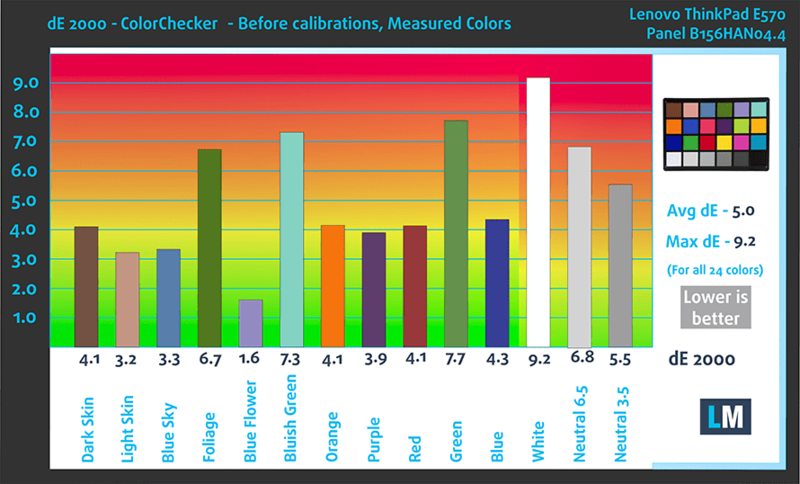 We’ve also measured the color deviation (dE2000) compared to the center of the screen and it’s 3.5. Usually values above 4.0 are unwanted. Since it’s a budget configuration, the panel is also budget-oriented and the sRGB color gamut coverage is limited to just 53% but it’s enough for general multimedia, web browsing and office work. We recorded Fall Time + Rise Time = 31 ms.
Our equipment wasn’t able to detect any pulsations throghout all brightness levels. In this regard, the display can be considered harmless and it’s suitable for long hours of work. Although the panel clearly is far from perfect, it’s good enough for the purpose of this model. The display offers excellent contrast ratio, good visibility in bright rooms and enough sRGB coverage for your usual web browsing and office work. And since this is an IPS panel, viewing angles are also excellent. The most important thing to consider here, however, is the absence of PWM making the display suitable for long working sessions. But if you want the best out of this display, we suggest downloading our custom profiles as they improve visibility for gaming and multimedia and also improve the overall color accuracy while reducing the negative blue light emissions. The sound quality os somewhat satisfying. At low frequencies, the loudspeakers are good but there’s not enough clarity in medium and high frequencies. 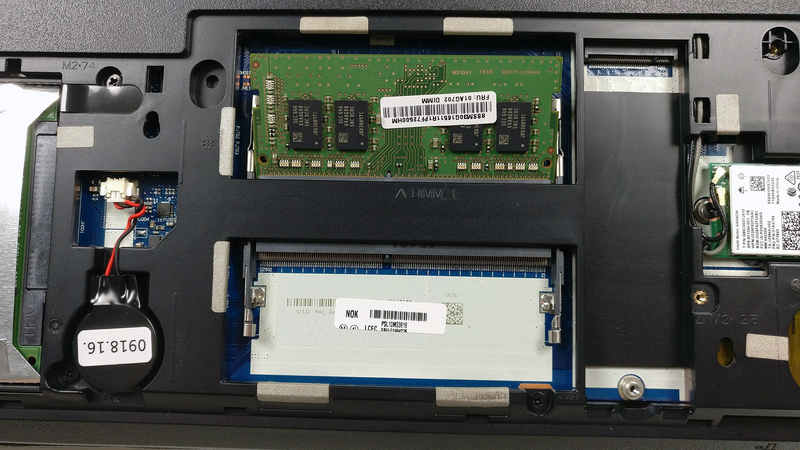 The notebook we’ve tested shipped with pre-installed Windows 10 (64-bit) and we used it for our testing. However, if you wish to perform a clean install without the bloatware, we suggest downloading all of the latest drivers from Lenovo’s official website. 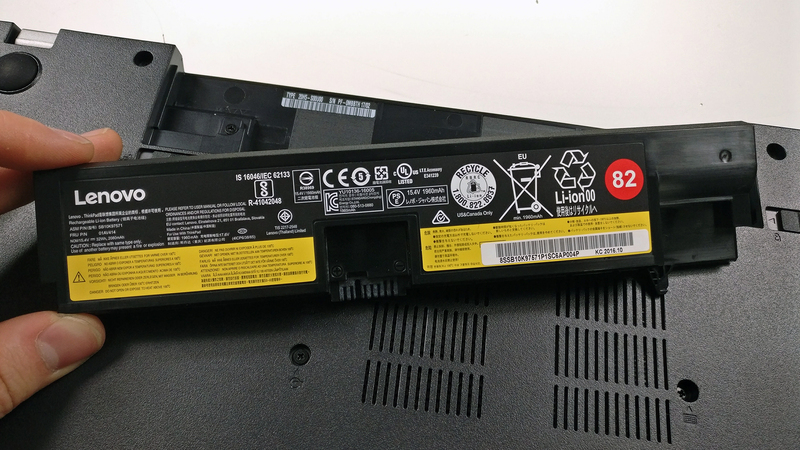 The ThinkPad E570 doesn’t hold an exceptionally big battery but our tests show just about the average endurance compared to other similarly-priced machines. The 31Wh unit balances between the energy-efficient Intel Core i5-7200U CPU and the power-hungry Full HD IPS panel but it’s still not enough to convince the regular business user, unfortunately. 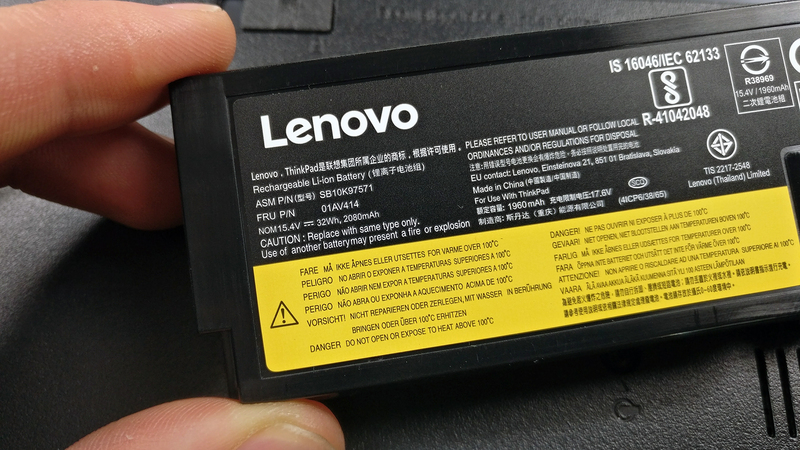 However, a quick research shows that the E570 sells with a different battery as well – 41Wh, which will greatly improve battery life while giving a small, probably unnoticeable – bump on the bottom. It should be worth opting for the configuration with a bigger battery. All tests were performed using the same conditions as always – Wi-Fi turned on, Windows battery saving feature switched on and screen brightness set to 120 cd/m2. Just about the average web browsing runtimes for a 15-inch mid-range laptop – 322 minutes (5 hours and 22 minutes). The video playback score is considerably lower than expected – 239 minutes (3 hours and 59 minutes). It’s quite unlikely that you will start a gaming session without being close to a power source, but it’s good to know that you can play a bit more than an hour away from the plug – 72 minutes (1 hour and 12 minutes). Here you can see an approximate comparison between the CPUs that can be found in the Lenovo ThinkPad E570 models on the market. This way you can decide for yourself which Lenovo ThinkPad E570 model is the best bang for your buck. 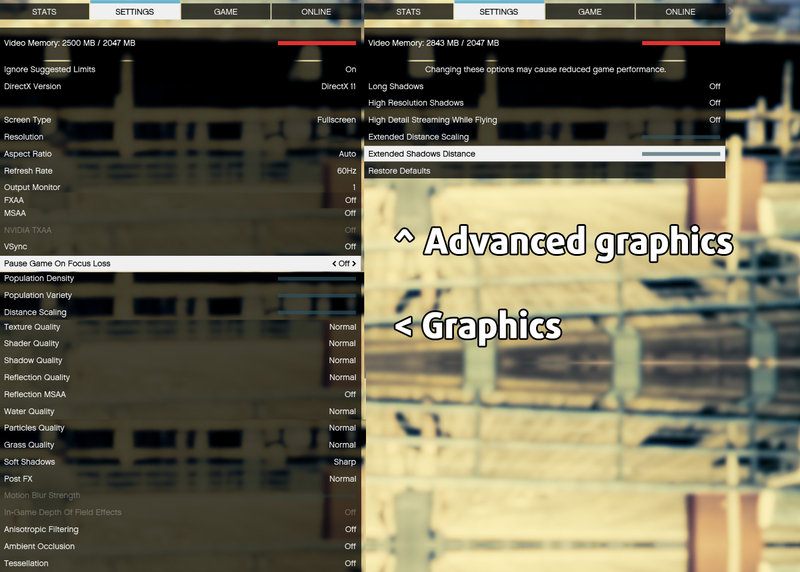 Here you can see an approximate comparison between the GPUs that can be found in the Lenovo ThinkPad E570 models on the market. This way you can decide for yourself which Lenovo ThinkPad E570 model is the best bang for your buck. 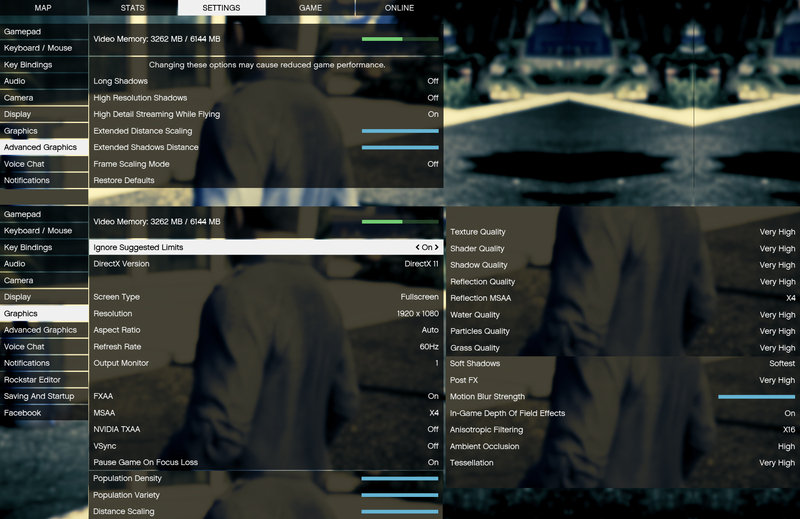 The stress test that we perform isn’t a good representation of real-life use since everyday tasks and even gaming can’t put 100% load on the CPU and GPU at the same time but it remains as the best way to determine the overall stability and effectiveness of the system as a whole. 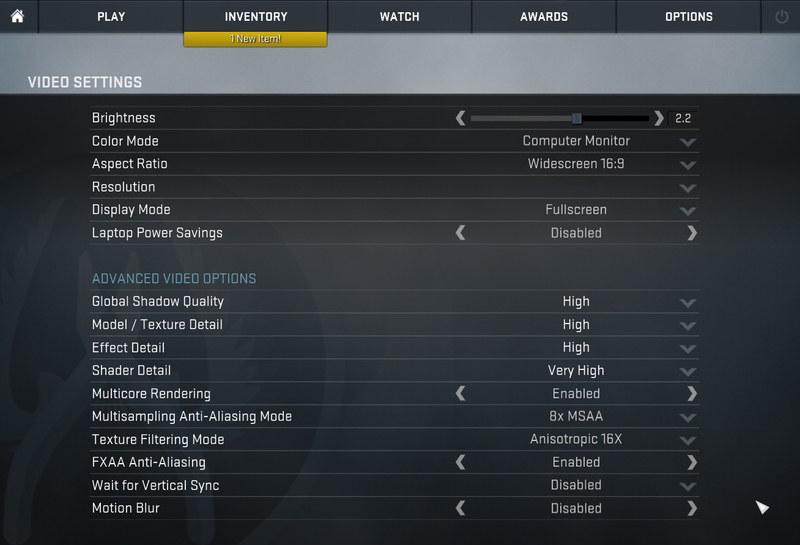 Also, take note that the unit we used for the stress test differs from the one we reviewed. The one used for the torture test is equipped with a Core i7-7500U CPU but still uses the same GTX 950M GPU. We start with 100% CPU load for an hour. At first, the chip was able to utilize its full clock speed of 3.5 GHz but after a few seconds it dropped down to 3.1 GHz and staying there for good. Temperatures were acceptable at that point. 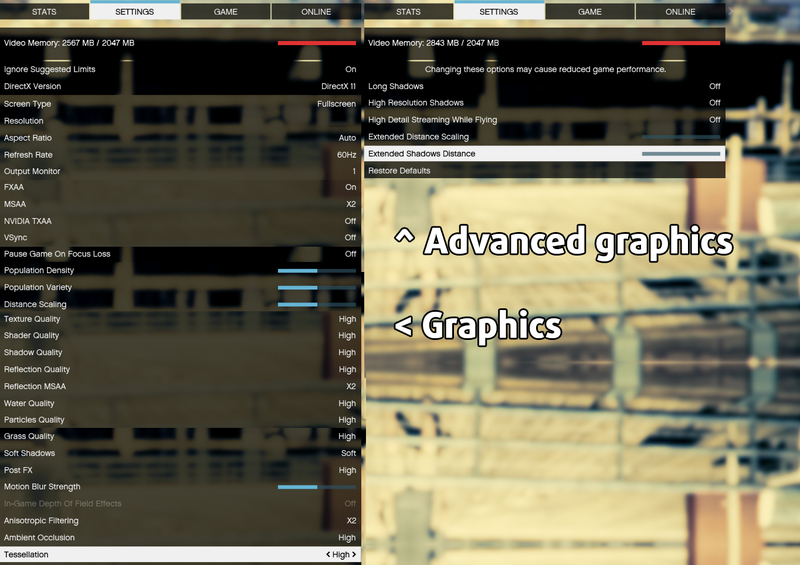 When we turned on the GPU stress test, however, things changed rapidly. 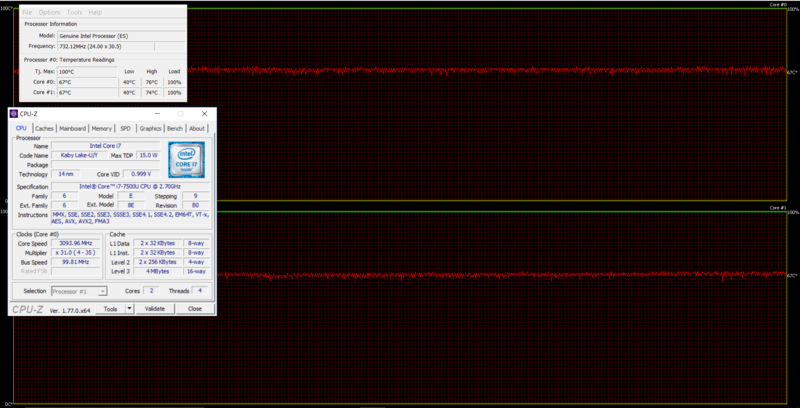 The CPU started throttling after a while whereas the GPU stayed at its base 915 MHz. Both chips ran pretty hot and it can be felt on the surface as well. As you can see from the heat map below, the left side of the interior and the center of the keyboard were pretty warm but only after extended heavy workload. We want to remind you once again that the laptop isn’t built for such use and it’s not gaming-oriented. 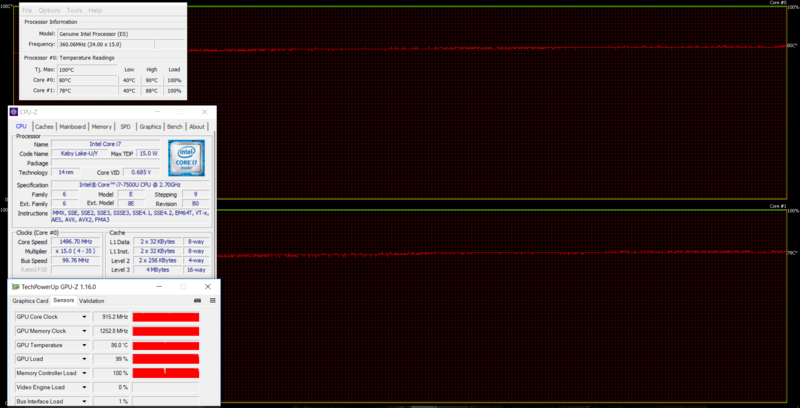 Moreover, the cooling fan ran pretty silently during the whole test. When we started this review, we were expecting to review strictly business-oriented machine. However, our tests suggest otherwise. 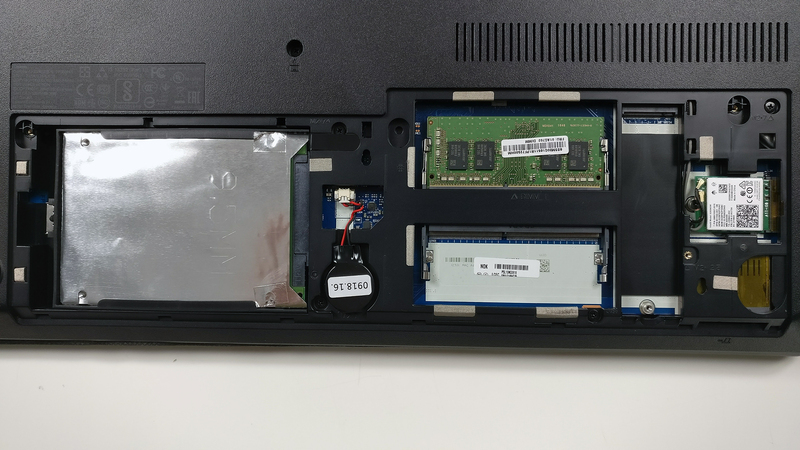 The Lenovo ThinkPad E570 appears to be more of a well-balanced, mid-range mainstream machine with just a few missteps along the way. Build quality is okay, input devices are excellent and upgradability is easy. 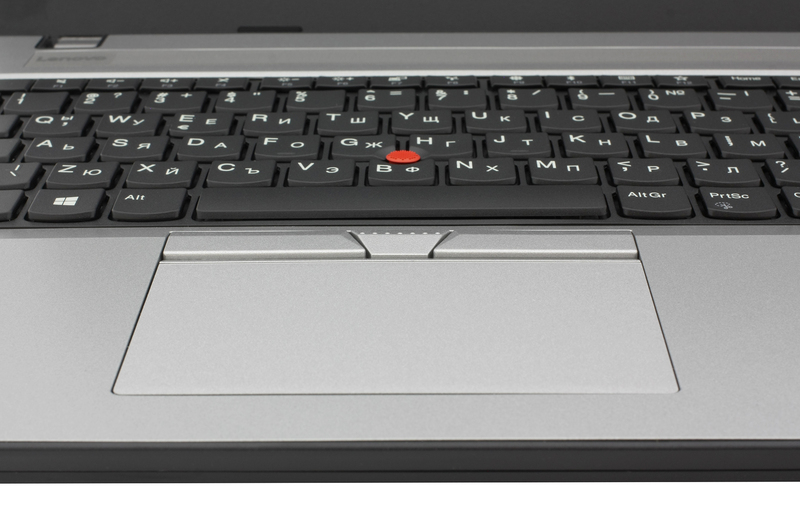 Our only complaint from aesthetic point of view would be that the silver model just doesn’t fit the whole black design of the keyboard, touchpad and the chassis as a whole. But that’s more of a personal opinion. To make things even more interesting, Lenovo has included a decent IPS panel suitable for work, web browsing and even multimedia. You can always opt for a similarly-priced machines with just about the same hardware but you will be missing an IPS screen. Speaking of multimedia, the GeForce GTX 950M with 2GB of GDDR5 memory is not only capable of handling multimedia tasks but it’s also suitable for gaming. 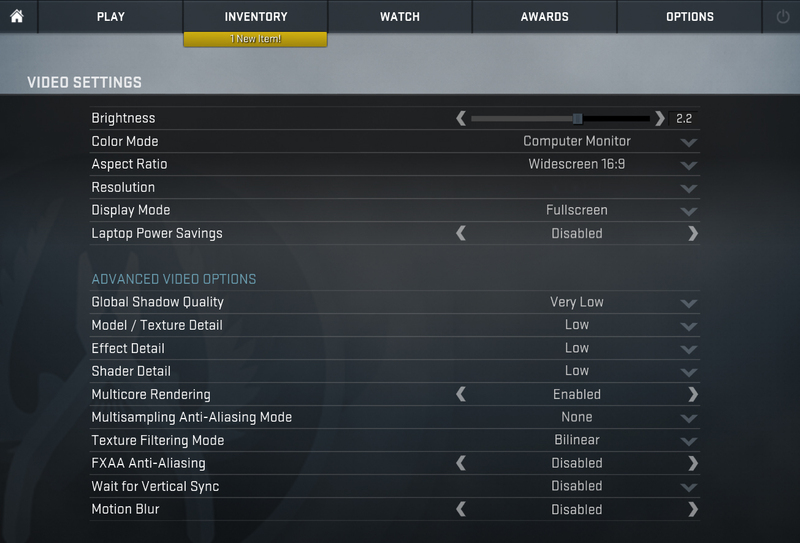 Our gaming tests confirm that you can run a good chunk of the modern titles with low to medium settings. So the only thing missing here is a good battery life. When it comes to web browsing, the runtimes are decent but anything other than that will drain the battery pretty fast. And, of course, users getting this machine strictly for business purposes won’t be happy about that. Luckily, Lenovo is offering the laptop with bigger battery configurations although, this will probably cost you extra. In any case, the ThinkPad E570 with GTX 950M is a surprisingly good all-rounder without sacrificing most of the necessary business features along the way but be aware of the relatively poor battery life. Hello guys. Is it possible to use all of your profiles at the same time? The idea is to have the benefits from all of them simultaneously. Does the e570 support 2 external monitors without a docking station? Whats the difference between the E570 and L570? Both can be bought with the same (or very similar) components, but L costs more. Yes, it’s (the L) got a bigger battery. Does that last longer, or does the L use more power?